Find out which signs of depression are most commonly linked to children with autism so they can get the help they need. Gain top advice from the managing director of an education consultancy service on finding special educational options during a relocation. Learn how working with a personal trainer can help people with special needs with communication and socialization. Learn effective methods for correcting and teaching a child with autism through directive statements, visual supports, and "first-then" language. A writer with Asperger's syndrome shares his tips for handling job stress and working with colleagues. Learn about the multiple advantages of art therapy for people on the spectrum. Learn how special supports and training can help a family affected by autism long-term. Meet the compassionate mother of five and philanthropist who created an equine-assisted learning horse therapy program that helps people with special needs develop critical life skills. Be inspired by the advice of an author and motivational speaker who triumphed after being diagnosed with severe learning problems and autism as a child. Learn a variety of simple activities and tasks that can help someone with autism develop sequencing skills to help improve organizational and prioritization skills. Find out why kids with autism become easy targets and how to potentially stop bullying in its tracks. Discover what educators and parents need to know about one another in order to create a better understanding and environment for learning. Learn how utilizing ABC: Everybody EATS! in your home may help you and your child with autism. Discover ways to overcome inertia by harnessing the lower brain with rewards and negative reinforcers using imagery, by breaking up a motor sequence into steps, and using rhythm. The mother of a young boy with autism writes an open letter to a mysterious woman she met by chance at an arcade. This engaging DK book with a foreword by Maureen Healy is a must for kids as they work to understand and handle their emotions. Find out ways applied behavior analysis can help your child with autism increase independence and enhance the quality of life. Find out how to provide extra understanding and support for your child with autism during a family divorce. Take a look at this charming book written by parents Jamiyl and Tracy-Ann Samuels that highlights a young boy with autism with a great imagination who becomes a superhero. A tender short story portraying a man's struggle to place his youngest brother with autism into respite care the night of their mother's passing. May Ng, MBBS (Hons), DCH, FHEA, FRCPCH, MSc, LLM, PhD, has put her research, personal experience, and vast knowledge into an inspirational book that fills the gap for families affected by autism. An author and motivational speaker interviews a mother who was inspired by her son diagnosed with autism and apraxia to start an amazing support group for hundreds of families affected by autism. April Spotsville, LMSW, and Elissa Weaver, MA, have provided a delightful way for parents and teachers to talk about special needs and acceptance. Find out from a financial planner the steps you can take to help set long-term goals and secure your loved one's future. Does daily life seem like a struggle? Balancing work and family can be hard, but when you're also trying to manage the challenges of autism, the solutions you need can seem very far away. In an effort to help you find the answers you need, this month's issue focuses on key topics affecting autism families all over the world. We cover the psychological, emotional, educational, and financial needs of children as well as provide methods to gain language and organization skills. We are here to help you find the solutions you need. Did you know teenagers with autism spectrum disorder (ASD) have an increased risk for low moods and depression compared to their neurotypical peers? It's often difficult to recognize the signs of depression in children on the autism spectrum, so we asked Andrés Fonseca, MD, MSc, MRCPsych, FRSA, and Samantha Glass, BSc (Hons) student in psychology, to share with us which symptoms are most common. Please take a look at How Do I Know If My Child With Autism is Depressed? so you can recognize early signs and get your child the help he/she needs. Divorce is a topic children with autism often need extra help processing as it can be an abstract concept. Arlen Gaines, MSW, LCSW-C, ACHP-SW, and Meredith Polsky, MSW, LCSW, MS special education, authors of the book I Have a Question About Divorce, say children with ASD often have a hard time understanding and interpreting emotions, which means divorce can feel even more complicated and confusing. For special guidance, read their piece How to Help Someone With Autism Handle Divorce to learn ways to provide extra support for your child during a family divorce. As a parent, the very thought of your child being physically or emotionally bullied is terrifying. In a recent US study of more than 400 children aged four to 17 with Asperger's syndrome or nonverbal learning disorder, conducted by Issues in Comprehensive Pediatric Nursing, mothers reported that 75 percent of children had been bullied by peers or siblings in the previous year. Sadly, the overall prevalence rate of peer victimization was 94 percent. For details on why kids with autism are often vulnerable to this abuse and to find ways to stop bullying in its tracks, take a look at Emily Andrews' article When ASD Children Become Easy Prey For Bullies. Finding the resources you need to help guide your child is critical for development. We often receive questions from our readers asking for information about different autism therapies, especially applied behavior analysis (ABA). In an effort to educate families new to autism, we asked Sally Burke, MSEd, BCBA, the director of early intervention at Behavioral Concepts, to provide a piece defining this therapy and explain how behavior analysts can help children with autism increase skills. Take a look at Ways ABA Therapy Can Help Improve Skills For Life for guidance on this special needs resource. Connecting with our readers has always been a key ingredient in creating a supportive autism community. We recently received a letter from a woman concerned about the potential repercussions of her grandson being scolded harshly for not following instructions. APM writer Kelly Beins, BHSc, OTR/L, responded with an informative piece called Expert Advice on How to Manage ASD Behavior Without Yelling. Take a look as she shares effective methods for correcting and teaching a child with autism through directive statements, visual supports, and "first-then" language. Her advice on how to manage your stress and ways to model and praise positive behavior will help all parents and caregivers. A good number of articles this month center on ways to conquer life's many challenges, whether you're at home, school, or in the workplace. For example, take a look at Nur Amalina Zulkifli's interesting article on the multiple rewards of art therapy for children with ASD, as well as Joshua Garrin’s, PhD, CPT, CHC, piece on ways personal training can increase communication and socialization skills for people with autism. 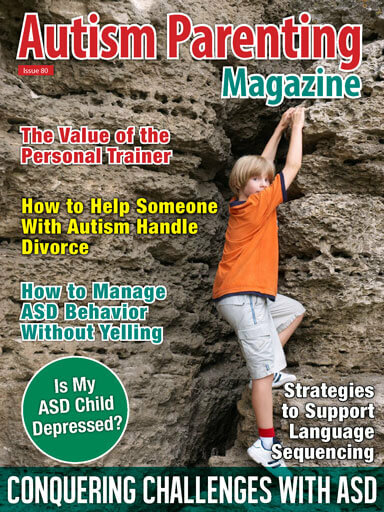 We also feature articles on ways people with autism can better deal with job stress and find strategies to support language sequencing, as well as a piece on ways parents and teachers can create better dialogue. We even have firsthand tips from a young man with autism on how to get moving with inertia. Do inspirational stories help you get through the tough days? This month we introduce you to Michael Haigwood Goodroe, a remarkable author and motivational speaker who triumphed after being diagnosed with severe learning problems and autism as a child. Once told by experts he would never lead an independent life, Michael went on to earn a BA in history, an MBA, and now works full time. We also share the story of Karin Taylor, a model who shares her heart with the special needs community through a horse therapy program that helps people with special needs develop critical life skills. Their perseverance has brought so much to the autism community. This special community that has developed over the past six years continues to grow daily. 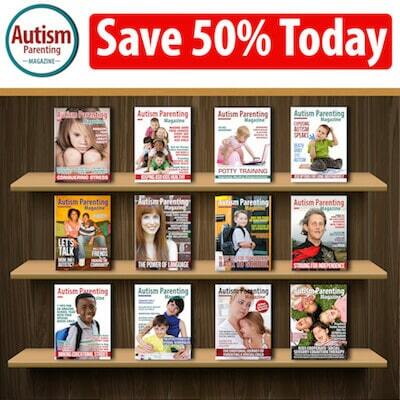 Be sure to check out our Autism Parenting Magazine Facebook page as well as our special page called Autism Support Groups for Families which provides a place to share experiences and advice, and to connect with other families. Everyone is invited. Thank you for choosing to be a part of our extraordinary autism community.